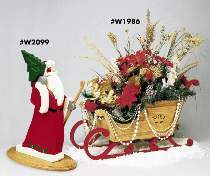 Father Christmas is the perfect complement to our Elegant Sleigh project. Father Christmas is made by cutting individual pieces of wood which are then glued together and painted. This simple procedure results in a striking 3-dimensional effect which is very easy to paint. Stands 21"H. The Elegant Sleigh is one of the most spectacular centerpiece projects we’ve ever seen. Make from a single 2 ft. x 2 ft. sheet of 3/8" oak plywood and 3/4" stock. The sleigh measures 9-1/2"W x 24"L. Plans drawn FULL SIZE. Build both projects and save with the #W2120 Plan Special which includes both plans only. Order spindle and oak plywood separately.